Calendar apps are extremely efficient and important in fulfilling everyday activities with ease and speed. And, with so many apps available in the iOS market, we have today compiled the best apps that are functionally useful and active in adding events and finding the upcoming ones in a simple and direct layout and design. One of the easiest to use and read, the fantastical 2 app comes with two impressive options. First, one can view the calendar in portrait and landscape mode with a week ticker while having a monthly calendar on top. The landscape mode also allows you to have a block view of the entire week’s schedule. Secondly, the app can merge events and iCloud reminders. Calendar 5 is another very useful calendar app designed with a monthly view showing events on one single grid. The app comes with a colour coded design depending on the type of the calendar. Perfect for viewing your monthly schedule, you can also switch between daily and weekly views as per the time and preference. The events for a single week come together in one row. You can also display your daily tasks in a schedule like a list without the need for a calendar. The Google’s calendar app as you would already know syncs easily with Google calendar and provides detailed information from your account. You can also sync it with other Google services like Gmail and automatically store the flight and hotel reservation details. The informant is a multifunctional calendar app that is also a task manager, a weather tracker, a note keeper, and much more. You can see the list of scheduled events and to-do list on the same screen and easily switch between daily, weekly and monthly views. The lists involving tasks stays on top of the screen when undone and once you are done with any specific task, the item gets cross out from the list. You can also prepare separate calendar tasks for home and work and easily switch between the two as per requirement. Cal is a free, very simple to use calendar app available for your iPhone. The app is designed with a fast user interface to enhance easy usage right from your home screen. The app comes with a usual date ticker and monthly calendar and it can also be integrated with the todo manager. Horizon 3 app displays the supposed weather setting along with each calendar event. You can also see the high and low in the weather for the day along with a pictogram describing the same. Timepage is one of the best calendar apps if you use calendars just for the very important events of your life. Not too congested with many features and option, the app offers a simple planner with a minimal and user-friendly interface. Colour coded circles help to highlight and illustrate the busiest days. Shift app is designed to fit the requirement of the customer. If your work doesn’t fall under the standard 9 to 5 profile then this app is the best fit for you. 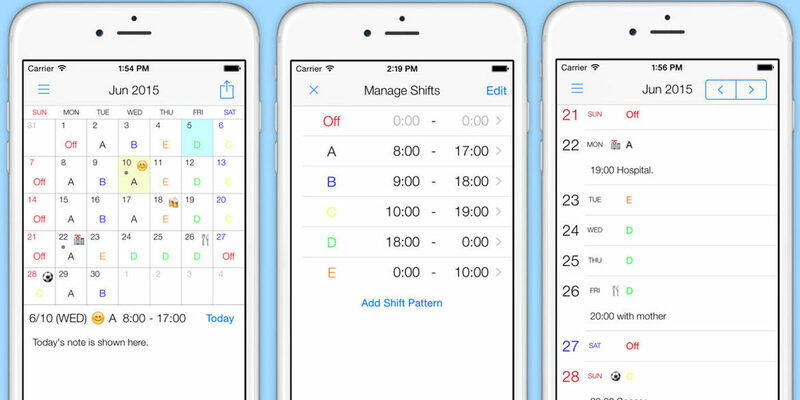 You can mark and set a reminder for the upcoming shifts just with a simple tap. You can even add a moon icon to the calendar for the night shift and sun icon for the day shift. With a beautiful design, the app is certainly a creative take on the conventionally designed calendar apps. Install your phone with the best calendar app to never forget an important event in your life.